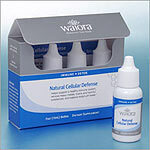 Natural Cellular Defense™ (NCD) by Waiora is 100% natural, non-toxic, and is derived from zeolites. It's developed through a unique manufacturing process that not only removes all impurities from the starting zeolite mineral, but "activates" the free-floating cages or boxes so that they are preloaded with magnesium, calcium, and phosphorous ions which not only exchange easily with heavy metals, but are also healthy for the body. The supplement is so efficient that just 100 drops has the equivalent toxin absorption area of nearly 8m�! There is no other health supplement on the market that is as pure or as effective at detoxifying the body. Not only is it on the FDA's General Recognized As Safe list (FDA GRAS), the supplement is so safe that it has been taken by pregnant women and babies with absolutely no side effects. Natural Cellular Defense™ has been clinically formulated to help support a healthy immune system, remove heavy metals and toxins, and balance your body's pH levels. Natural Cellular Defense™ took fourteen years of extensive development and testing to become the powerful supplement that it is today. As a starting material, the same top grade zeolite used by NASA is also used in the NCD manufacturing process. It's sourced from mines in Montana and Texas that are known for their zeolite purity before the mineral is put through the liquidation, purification, and activation process. ". the old adage, 'an ounce of prevention is worth a pound of cure', takes on a new meaning with cancer. Where cures are seldom, an ounce of prevention is worth years of an otherwise shortened life - vs - a ton of ineffective and miserable treatment. Since most cancers are caused by toxins we either ingest or inhale, prevention means ridding our bodies of these toxins. I will be using liquid zeolite and I will be recommending this to every member of my family and every patient I see." If you're ready to try this amazing supplement today, click the button below to find out how to order Natural Cellular Defense™. *Note: These statements have not been evaluated by the Food and Drug Administration. These products are not intended to diagnose, treat, cure or prevent any disease. Natural Cellular Defense™ is not a medicine.